Over the last three days, Exxon Mobil (XOM) shares have been testing their lows of the year. The price action at this point in today’s session looks positive, but I would caution that the stock price needs to close in its upper range, to support this reversal in sentiment. A close in the lower end of today’s wide range would reflect some rejection and create a bearish high wick candle. Be cautious and understand that it will take time for this beaten down sector to make technical repairs. 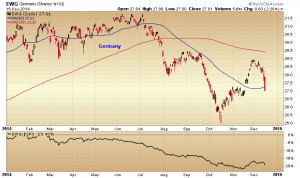 The Germany iShares (EWG) fund has joined the rest of the major Europe iShare funds and dropped below its 50 day moving average. The graph at the bottom of the chart shows the year-to-date underperformance of the EWG, the strongest of the Europe funds, relative to the S&P 500 index. 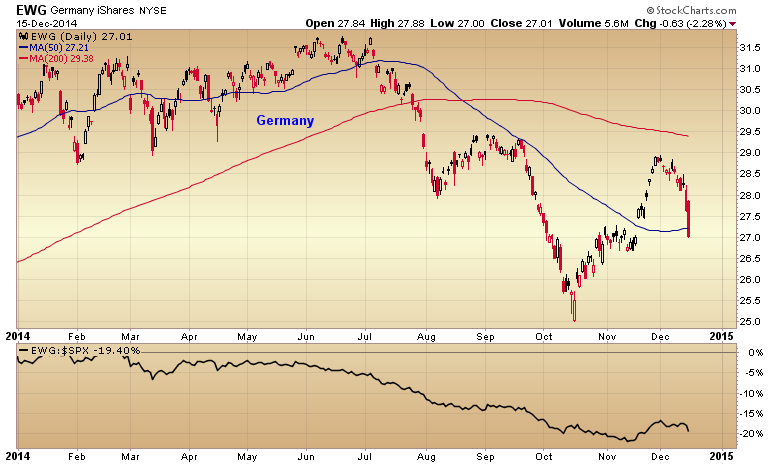 Hopefully, Europe is not leading because the U.S. markets would have a lot of catching up to do to the downside. In a CNBC interview this afternoon, Bill Gross suggested TIPS as an investment idea. The weekly chart of the iShares Barclays TIPS Bond Fund (TIPS) shows the 10 week (50 day) moving average crossing above the 40 week (200 day) moving average earlier in the year, and the fund price rising up through the Fibonacci retracement levels measured off the 2013 range. 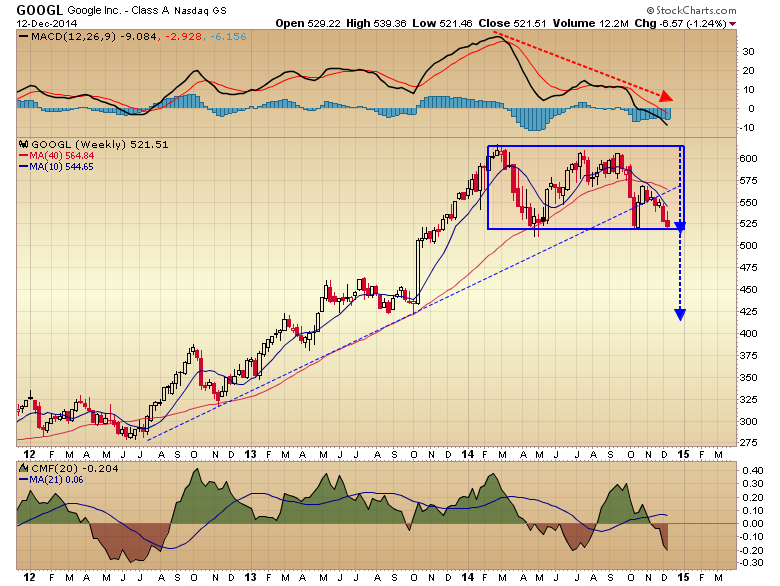 They pulled back at the 62% level in August and have returned to twice test the 38% retracement level. The downtrend line drawn off the highs since August and the 38% reistance-turned-support level have formed a triangle pattern on the weekly chart. 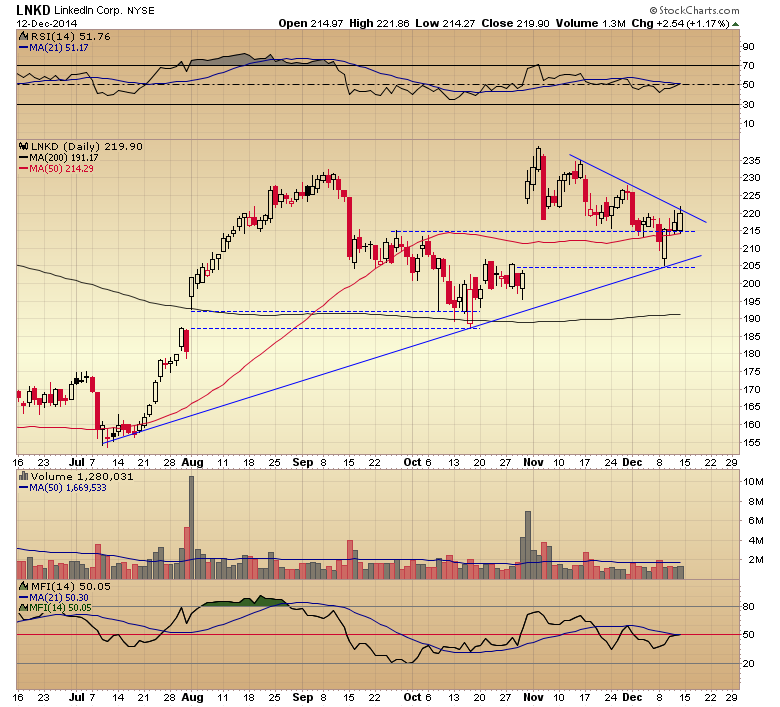 A break above pattern resistance projects to the $117.00 area. 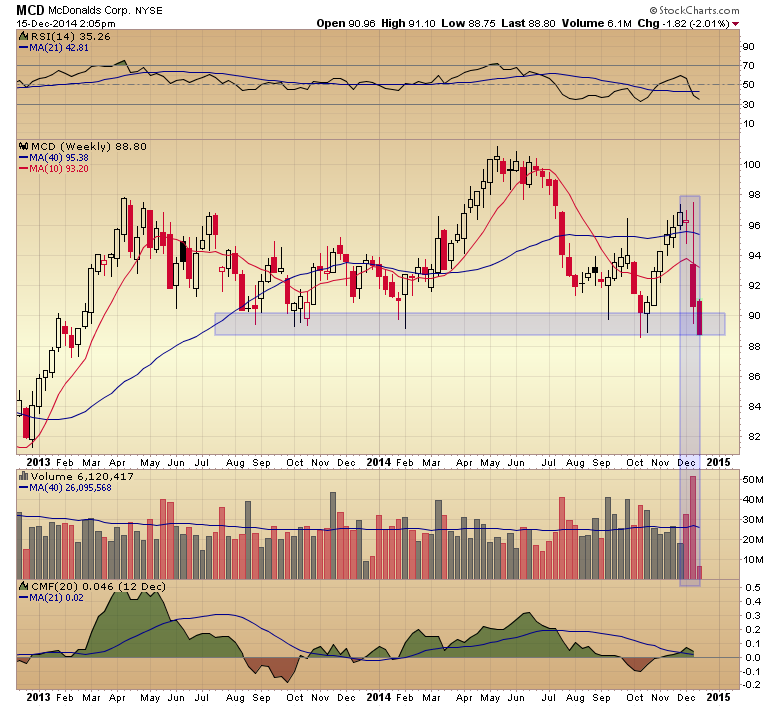 The December decline in McDonalds (MCD) continues with the stock price down about 2% at this point in the session, but testing a zone on the weekly chart that has supplied support for 18 months. Linkedin (LNKD) shares broke their 50 day moving average this week, closed the October gap on the daily chart and bounced off the May/July/November uptrend line, then moved back up through the 50 day average, to test a downtrend line drawn off the November highs. This was impressive action in a decidedly down week for the broader market. 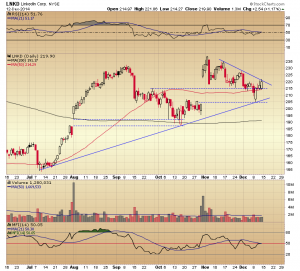 It looks like the stock price is poised for a breakout. Like many other stocks that I follow, Google (GOOGL) has been consolidating for most of the year, and is currently testing technical support. In the case of Google (GOOGL) the consolidation took the form of a horizontal channel and Friday’s close is retesting the pattern bottom. 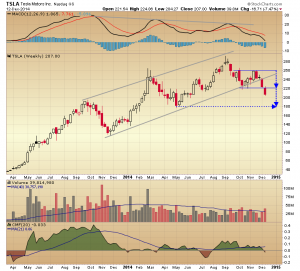 The MacD and Chaikin Money Flow are both tracking lower and below their centerlines, and a pattern breakdown projects a target price in the $412.00 area. 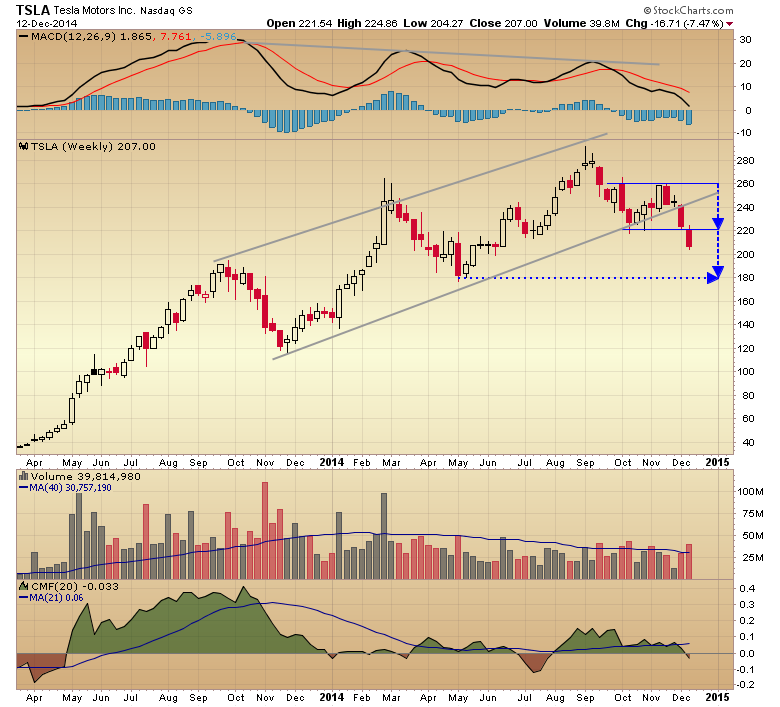 Tesla (TSLA) shares had been making a series of higher highs and higher lows, trading in a rising channel on its weekly chart. Two months ago it began moving in a sideways channel, two weeks ago it broke the rising channel uptrend line, and last week it took out the October low. The MacD has been in bearish divergence for most of this year and this month the Chaikin Money Flow Index crossed below its centerline, reflecting distribution. 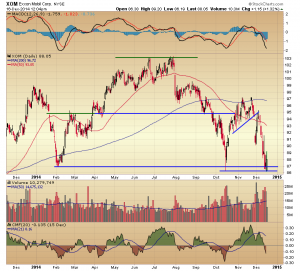 The downside price target is the April low in the $180.00 area. 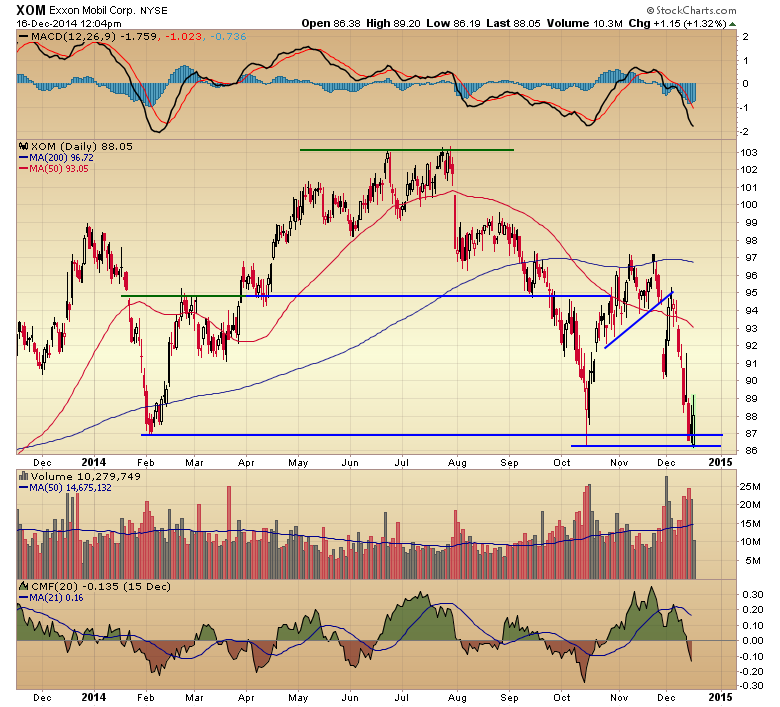 Exxon Mobil (XOM) shares are testing their 2014 lows. Last month a large cup and handle pattern formed on the daily chart and it looked like the stock was poised for a big move higher. That proved not to be the case, the rim line was never penetrated and the stock price collapsed along with the rest of the energy sector. 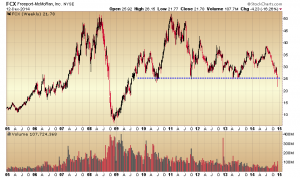 The $82.50 to $80.00 area is the next zone of support. 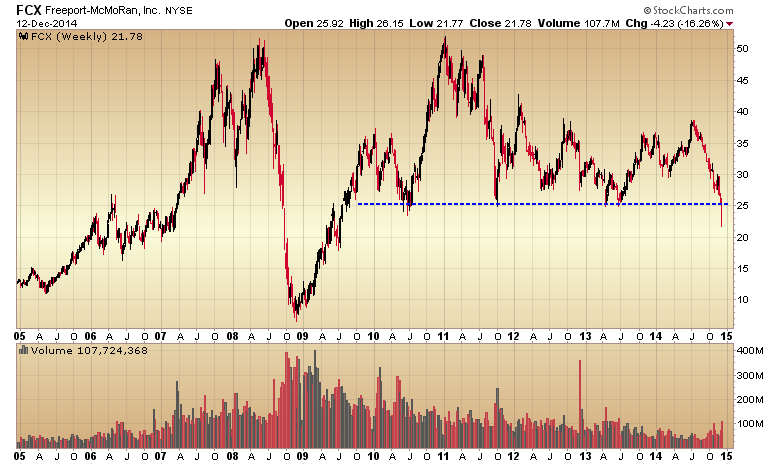 On Tuesday, I noted that: Freeport-McMoRan ($FCX) shares are testing a five year support line. At the same time, the RSI and volume-weighted Money Flow Index are simultaneously oversold. The last time they were in this coordinated condition was at the 2008 low. Support was taken out and the stock is down over 16% on the week. The next level of near term support? Good question. 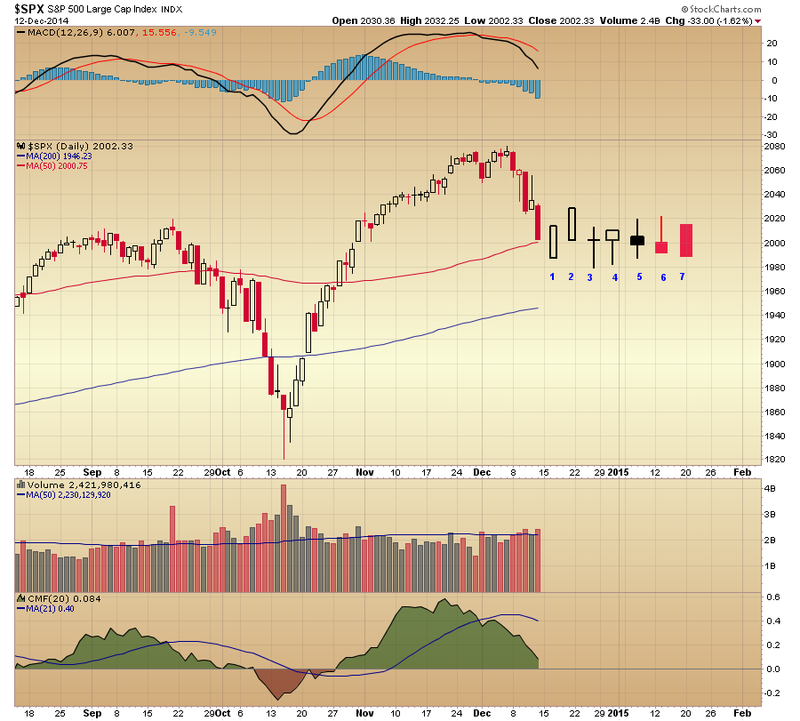 This week the S&P 500 index reverted back to and closed on its 50 day moving average. It is a logical technical level for a bounce, but penetration of this key average could signal a second phase to this week’s decline. I’ll be looking at the price action in the Monday session and the candle that forms on the daily chart as a tell for the short-term direction of the index. Here are some possible outcomes illustrated on the chart and their implications going forward. 1. Bullish Piercing Candle – There is an opening gap lower on Monday and then the index moves up into the center of Friday’s candle, closing near the high. 2. Bullish Two-Day or “Tweezer” Reversal – The candle opens at Friday’s close and closes up at Friday’s open. 3. This a classic “doji” candle often seen at turns in the market or as a component of the three-day Morningstar reversal pattern. 4. The bullish hammer candle has a narrow opening and closing range and long tail, and often “hammers out a bottom” at key levels of support. 5. This neutral “spinning top” candle has a narrow opening and closing range centered around a wider range of price movement, and reflects indecision about future direction. 6. The bearish shooting star candle is the reverse of the hammer candle and reflects a failure to hold its upper range, with the close fading back to the open. 7. This large dark “marubozu” candle opens on its high and closes on its low, like the candles we saw in the Wednesday and Friday sessions and we don’t want to see in the Monday session. Of course, there are any number of ways the price action on Monday will unfold, but I will be alert to the formation of any of these particular candles.